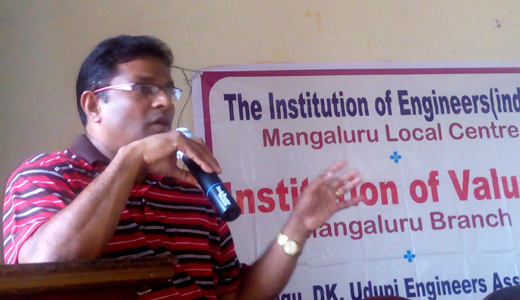 Mangaluru, July 2, 2015: A news release on the gathering of eminent Senior Engineers gives an insight into the garbage local problems was welcomed by Er. Dr. Annappa ,Hon. Secretary, IEI. Er. Dr. Shrihari presided over the Meet. Er.M.Divaker Shetty, Gen. Secretary, thanked the gathering of elite engineers. 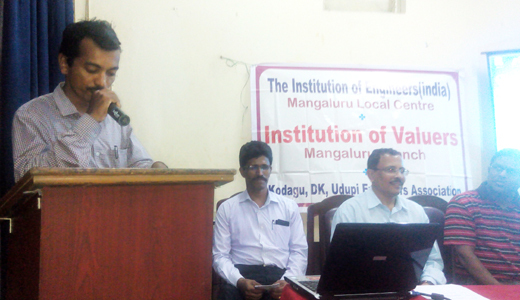 Dr.Babu Alappat, Professor from IIT Delhi, addressed the Forum of Institution of Engineers IEI, Mangaluru Local Centre, Institution of Valuers,Mangaluru Branch, and Kadagu, DK & Udipi Engineers Association at Hotel Woodlands,Mangaluru July 1. He said that ’Biological degradation or waste disposal by using landfills is still the Best form of waste management. Mangaluru needs urgently a proper study. Citing the recent label for Delhi as ’Garbage Capital’, due to the Strike of ’Safaai Karmacharis’. More than 9000 tons of garbage is generated per day in Delhi and the three Landfills looked like a huge mountain. Using Landfills won’t solve the problem because the Waste generated is huge and it takes more than 6 months for the waste to convert. Being an authority in incineration ie; burning the waste, Prof. Alappat described the various methods of waste disposal & power generation. He said "My grand parents use to compost , the waste , using cow dung , leaves and other bio degradable waste by composting and using it as manure after 6 months and that is the perfect way of waste management, though they didn’t have any degree from IIT" Indians and Chinese had perfect understanding of waste management, he added. The waste needs to be segregated before burning it. Some types can be directly incinerated / burnt, the hazards in doing so were also explained. Plastic that forms a major part of the waste need to be segregated. PVC and Polyurethane is hazardous if set fire to. But, how do you segregate it? This poses a major hurdle as the plastics are not properly labeled. Hospital wastes, bio medical wastes, Toys, buckets, etc cannot be burnt off hand so there has to be pre segregation. ’Waste to Energy’ was a topic. 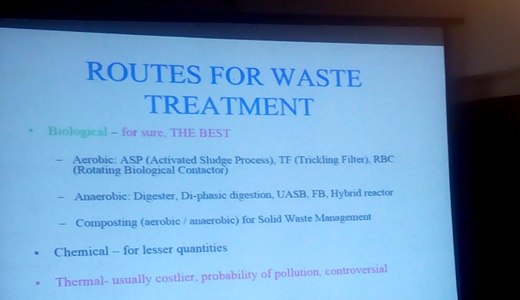 Prof.Alappat explained with a power point presentation, the various disposal techniques and how power could be generated from the waste to run the Plant. After in depth and enlightening talk, the forum was open for discussion.